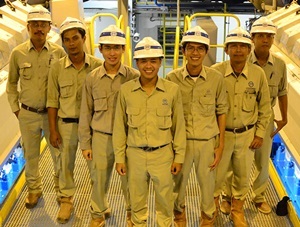 PT PP Energi - PP Energi is rapid growing company in Indonesia, running business in energy sector. Established in 2016, PP Energi has core business focus to developing energy resource potential in Indonesia into profitable investment portfolios. Its business include construction industry, infrastructure, electricity, power plant, renewable energy and converted energy, trading, area management, investment, operation and maintenance, electricity, steam gas/hot water and cold air procurement, garbage and waste management and other construction services. PT PP Energi is a directly-owned subsidiary company of state-owned construction firm PT PP (Persero) Tbk (PTPP Group). According to information found in PP Energi's company website as cited by JobsCDC.com, PTPP Group holds 99% ownership of the Company’s shares. PT PP Energi is based in Jakarta and its head office is registered at Plaza PP 7th floor - Jl TB Simatupang No 57 Pasar Rebo Jakarta Timur 13760. Minimum Bachelor Degree (S1) majoring in related field (Engineering/ Construction/ Business degree or related field or equivalent work experience). Have experience in managing and leading multiple projects (at least 5 projects in Downstream or Upstream). Preferably possess certification in Project Management Professional or MBA and have minimum 5 years of experience in project management and construction management. Demonstrated good interpersonal, verbal and written communication skills. Well-organized, detail oriented, and excellent analytical skills. Strong analytical and problems solving skills, good client and public presentation skills, and excellent oral and written communication skills. An entrepreneurial and creative approach to problem-solving in the field of downstream project development, enthusiasm and team building spirit. Minimum 3 years experience in business analysis, as business development officer, or a related field. Previous experience in Energy or Oil and Gas company is preferred. Minimum 8 years of experience as Construction Manager or Site Manager (especially in Oil and Gas Project Construction Phase). Strong knowledge of the fundamentals of scheduling, cost control, risk management, project and construction management. JobsCDC.com now available on android device. Download now on Google Play here. Please be aware of recruitment fraud. The entire stage of this selection process is free of charge. PT PP Energi - Officer, Manager Professional Program PTPP Group October 2018 will never ask for fees or upfront payments for any purposes during the recruitment process such as transportation and accommodation.